Professor Markus Barth has been awarded an ARC Future Fellowship in 2014 and leads the ultra-high field human MR research program at the Centre for Advanced Imaging. He graduated from the Vienna University of Technology in Technical Physics in 1995 and was awarded his Doctorate in the Technical Sciences in 1999. He worked as a Senior Researcher at the Donders Institute for Brain, Cognition and Behaviour (Radboud University Nijmegen, NL) and at the Erwin L. Hahn Institute for Magnetic Resonance Imaging (University Essen-Duisburg, D). Markus relocated to Brisbane and the University of Queensland’s Centre for Advanced Imaging in 2014. Blood oxygenation level dependent (BOLD) functional MRI gives a good picture of neural activation and connectivity in the living human brain non-invasively. 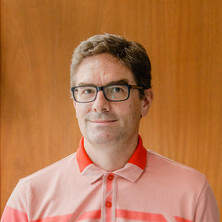 Prof Barth is particularly interested to identify small functional units of the brain, such as cortical layers and columns, in order to better understand brain function by developing very fast functional MRI techniques with the highest spatial resolution possible. Recently, he also addressed important neuroscientific questions such as memory consolidation during sleep and decoding measured functional signals (brain reading). He explored the possibilities of simultaneous acquisition of EEG and fMRI to examine the link between electrophysiology and BOLD task activity and large scale brain networks. Using high magnetic fields (3 and 7 Tesla) the spatial resolution of images can be improved significantly. For example, very small venous vessels and small bleedings in the brain can be visualised using specific contrasts, namely susceptibility weighted imaging (SWI) and MR phase. The MR phase information can be used as a very sensitive disease marker, e.g. for tumor angiogenesis or iron accumulation in certain brain structures in Parkinson’s disease. A new area of research is the exploration of cardiac MR at the ultra-high field strength of 7 Tesla and first results examining the anatomy and function of the human heart look promising. Markus has made significant scientific contributions in the fields of Cognitive Neuroscience, Neuroimaging, and MR methods at (ultra-)high field and key contributions to MRI scanner software packages, which are used in MR labs worldwide. Recent groundbreaking achievements include the development of accurate detection of layer specific functional activation in the human brain, decoding of brain activity and ultra-fast MRI. His current research interests are in the fields of MR method development including applications in neuroimaging and neurological diseases such as dementia and cancer, as well as cardiac MR.
Susceptibility weighted magnetic resonance imaging of cerebral cavernous malformations: prospects, drawbacks, and first experience at ultra-high field strength (7-Tesla) magnetic resonance imaging. Is MEG superior to EPI FMRI in localizing neuronal activity?